One of our favorite restaurants here in Rhode Island is Fluke Newport in…well…Newport. We’ve dined there for years, but big changes happened last summer when they hired a new chef. We met Chef Eddie Montalvo just after he had arrived at Fluke, and we were impressed with his new menu. We came back for another visit just over a month ago, and meeting Eddie again, we thought we would invite him and his family to our home someday for a visit. Well, that “someday” is tomorrow, and the reality that I’m going to be cooking for a real chef for the first time in my life is making me a bit nervous! I went to Twitter for some help. Since I follow a number of chefs, I asked the question: I’m cooking for a real chef for the first time. What’s the #1 tip you can give me? Only one chef answered, but it was none other than Andrew Zimmern, and he said simply: “Be yourself.” Be myself? Yeah…I think I can fake that!!!! So I started thinking…Chef Eddie works with seafood all day at Fluke. Skip that. He’s Italian and makes amazing homemade pasta. Skip that. What do I love to cook and do pretty well…? When I smoke my brisket low-and-slow in my smoker, I use a coffee steak rub that I developed a couple of years ago. It gives a deep, rich crust to the meat that is just fantastic. Low and slow is the way to go! Deliciously smokey and juicy. Depending on the size of the brisket, you might need to double the recipe. If the brisket is frozen, I like to thaw it a couple of days ahead of cooking it, rubbing it down with the coffee rub, and placing it in the fridge for about 24 hours to rest. I bring it out about an hour before smoking, to let the meat come back to room temperature, and then I place it in the smoker for about 12 hours at 225 degrees, smoking it with hickory wood. 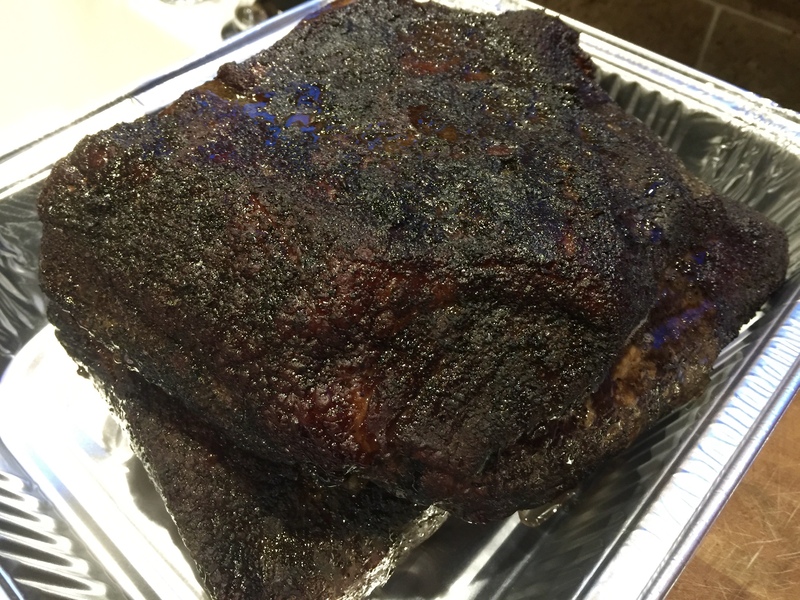 When it’s done, I remove it from the smoker, and wrap in foil and let it rest at least 30 minutes before slicing diagonally against the grain of the meat. If I’m not serving it right away, I place the wrapped brisket in the oven at the lowest setting, about 150 degrees, just to keep it warm. When I’m ready to serve, I always slice the brisket on the bias, against the grain of the meat.